Cycloadditions of carbonyl ylides derived from diazocarbonyl compounds involve the formation of a carbonyl ylide from a transient metallocarbene and carbonyl group, followed by 1,3-dipolar cycloaddition of the carbonyl ylide with a dipolarophile. 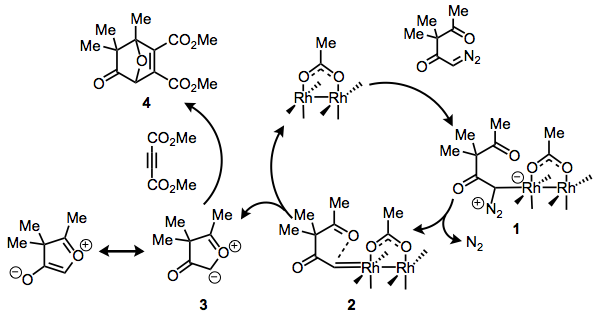 These cycloadditions have been applied for the synthesis of complex oxygen-containing ring systems. In the presence of a transition-metal catalyst, diazo compounds can form metallocarbenes. Interaction of a carbonyl group with the metallocarbene produces a carbonyl ylide, a 1,3-dipolar functional group with the ability to undergo cycloaddition with a variety of unsaturated dipolarophiles (Eq. 1). The products of this cascade process are five-membered oxacycles containing as many as four contiguous stereocenters. With the proper choice of catalyst and/or substrate, the stereoselectivity of these reactions can be quite high; as a result, cycloadditions of carbonyl ylides have been applied for the synthesis of chiral organic molecules. A general scheme for the mechanism of cycloaddition of carbonyl ylides is shown in Eq. 2. Although definitive studies on the mechanism of these reactions are lacking, characterization of discrete metallocarbenes by X-ray crystallography, computational work, and studies demonstrating reversible ylide formation have shed some light on the mechanism. Association of the metal catalyst with the diazocarbonyl starting material produces diazonium complex 1, which loses nitrogen to afford metallocarbene 2. An appropriately positioned (intramolecular or intermolecular) carbonyl group then associates with the carbene carbon, yielding a carbonyl ylide after loss of the metal catalyst. In some cases, the metal catalyst may remain associated with the substrate during the subsequent cycloaddition. The cycloaddition step is typically concerted, but can be highly asynchronous when polarized dipolarophiles are employed. Constitutional isomers may result from the cycloaddition step, depending on the orientation of the ylide and dipolarophile as the step proceeds. The dominant constitutional isomer can typically be predicted using frontier molecular orbital theory—the atoms bearing the largest orbital coefficients in the two frontier orbitals closest in energy become linked in the major product. 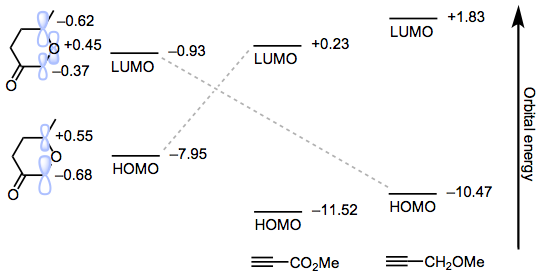 Notably, because the HOMO-LUMO energy gap in most carbonyl ylides is relatively small, the critical frontier orbital interaction is usually dictated by the electronic nature of the dipolarophile, rather than the ylide. For example, in the reaction of a prototypical ylide with electron-poor methyl propynoate, the dominant frontier orbital interaction is between the HOMO of the ylide and the LUMO of the dipolarophile (Eq. 3). When the electron-rich dipolarophile methyl propynyl ether is used, the dominant frontier orbital interaction is between the HOMO of the dipolarophile and the LUMO of the ylide. Studies of intramolecular cycloaddition employing configurationally defined dipolarophiles suggest that the cycloaddition step is concerted and stereospecific (Eq. 4). The tether approaches the ylide in an exo fashion, and the orientation of the methyl group relative to the tether depends only on the configuration of the starting alkene. The scope of cycloadditions of carbonyl ylides is quite wide. With respect to substitution at the diazo group, at least one carbonyl group is required to stabilize the intermediate metallocarbene. For intramolecular cycloadditions, that carbonyl group is typically incorporated into the tether, yielding a product with an endocyclic carbonyl group; examples in which the carbonyl group ends up exocyclic are much less common. With respect to the carbonyl group forms the carbonyl ylide, ketones, aldehydes, amides, esters, and imides have all been employed with success. The scope of the dipolarophile is also quite broad. In intramolecular reactions, simple alkenes, activated alkenes and alkynes, and ketones have been employed. Intramolecular reactions are somewhat limited by the need for structural complexity in the starting materials, although some clever methods have been developed to construct starting materials efficiently. In Eq. 5, cross metathesis, carbonyl ylide formation, and cycloaddition are carried out in one pot. The scope of the dipolarophile in intermolecular reactions is similarly wide; only simple alkenes have been demonstrated to fail. Myriad examples of both unactivated and activated alkynes and activated alkenes are known. Dipolarophiles incorporating an α,β-unsaturated ketone can react either through their C=C or C=O bonds, depending on the substitution pattern of the dipolarophile (Eq. 6). Cyclic carbonyl ylides derived from diazoketones are commonly used in intramolecular reactions. If the ylide is part of a five-membered ring, the diazoketone substrate should contain no hydrogens at the non-diazo α-carbon (the 3-position). If hydrogens are present at the 3-position, the resulting carbonyl ylide can collapse to a neutral enol lactone through 1,4-hydrogen transfer (Eq. 7). This limitation is also important for intermolecular reactions of five-membered, cyclic carbonyl ylides. Cylic carbonyl ylides derived from esters must be aromatic to react efficiently in cycloadditions (Eq. 8). Diazoimides have also been employed in these reactions; like other diazocarbonyl substrates, imides are almost always positioned such that they end up in an endocyclic position in the cycloadduct. The scope of intermolecular cycloadditions is somewhat broader than that for intramolecular reactions, because the preparation of starting materials is simpler. Still, in the majority of cases the diazo group and carbonyl group forming the ylide are found in the same molecule (i.e., the carbonyl ylides are cyclic). For example, a cyclic, ketone-derived carbonyl ylide is involved in the exo-selective cycloaddition reaction in Eq. 10. Anhydrides may react similarly to amides in intermolecular reactions; however, they often lose carbon dioxide and are known to undergo rearrangement in reactions with azodicarboxylate dipolarophiles (Eq. 11). In this case, loss of carbon dioxide followed by Mumm rearrangement results in acyl amidines. Acyclic ylides can be synthesized through the coupling of separate diazo and carbonyl compounds. Most often, these reactions involve intermolecular cycloaddition between the ylide and a separate dipolarophile (Eq. 12). This three-component reaction is particularly notable in light of side reactions available to the ylide. Side reactions associated with metallocarbenes can be a potential limitation of this class of reactions for specific substrates. For example, substrates with appropriately positioned C-H bonds may undergo intramolecular C-H insertion in preference to carbonyl ylide formation (Eq. 13). A judicious choice of catalyst can lead to selective carbonyl ylide formation. Direct cyclopropanation of the dipolarophile can also be a significant issue in these reactions. Since carbonyl ylide formation is often reversible, an excess of dipolarophile is usually employed to encourage cycloaddition. Cycloadditions of carbonyl ylides can establish up to four stereocenters simultaneously, and thus permit the creation of significant molecular complexity in a single step. Intramolecular reactions may be used to create mutliple ring systems, for example. Intramolecular cycloaddition was employed as a key step establishing the complex ring system of platensimycin (Eq. 14). Intermolecular cycloadditions of carbonyl ylides have also been employed in synthesis. In most cases, substrates for intermolecular reactions are more easily synthesized than comparable substrates for intramolecular reactions. One example of an intermolecular cycloaddition used in the synthesis of frontalin is shown in Eq. 15. Carbonyl ylides are most commonly generated from diazocarbonyl compounds. However, a number of alternative methods exist for the generation of carbonyl ylides for cycloaddition reactions. Although these methods often result in lower yields than comparable reactions employing diazocarbonyl compounds, starting materials are in some cases easier to access than the corresponding diazocarbonyl compounds. For example, thermal decomposition of epoxides can produce carbonyl ylides, which can undergo cycloaddition in an intramolecular sense. Although this method possesses high atom economy, yields are often low (Eq. 16). 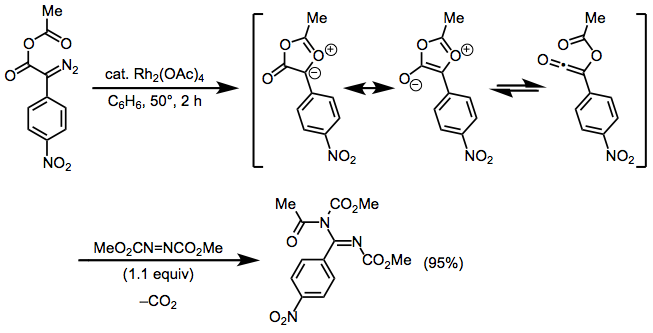 Retro 1,3-dipolar cycloaddition of substrates that can extrude nitrogen is a second alternative method for the generation of carbonyl ylides. The tandem [4+2]/[3+2] cycloaddition process in Eq. 17 illustrates that these reactions can build up molecular complexity quickly. Elimination-based methods employing acetals and base or heat can provide carbonyl ylides that are not accessible from diazocarbonyl compounds (Eq. 18). Rhodium carboxylate complexes are by far the most common catalysts used for cycloadditions of carbonyl ylides, although other metal complexes have seen limited application. Chiral rhodium carboxylates or those employing more exotic ligands may be obtained from Rh2(OAc)4 by ligand exchange. Catalyst loadings are typically in the range 0.2-5 mol%. In general for intermolecular reactions, it is important to maintain an excess of dipolarophile throughout the reaction to avoid side reactions. This can be achieved by employing an excess of the dipolarophile or by slow addition (by syringe pump) of the diazocarbonyl compound to a stirred solution of the catalyst and dipolarophile. Reactions are typically carried out in an inert atmosphere, and the presence of a drying agent may be necessary in some cases. A wide variety of solvents have been employed in these reactions; ionic liquids can facilitate separation of the cycloadduct from the catalyst and catalyst recovery. Diazo compounds and the reagents used to make them are often explosive and potentially toxic; thus, these compounds should be handled with great care. Reactions should be carried out in a well-vented fume hood behind a blast shield. Rh2(OAc)4 (2 mg, 0.004 mmol) was added to a stirred solution of the unsaturated ketone (150 mg, 0.68 mmol) in CH2Cl2 (5 mL) at rt. After 30 min, the reaction mixture was evaporated under reduced pressure and the residue was purified by column chromatography (SiO2, EtOAc/hexane) to give the cycloadduct as a clear oil (125 mg, 98%): 1H NMR (300 MHz, CDCl3) δ 0.65 (m, 1H), 0.9–1.4 (m, 6H), 1.5–2.2 (m, 8H), 4.50 (d, J = 6.3 Hz, 1H); 13C NMR (75 MHz, CDCl3) δ 11.3, 12.3, 21.4, 25.0, 26.7, 32.5, 34.8, 37.3, 39.4, 80.4, 84.2, 213.6. HRMS calcd. for C12H16O2 192.1150, found 192.1146. ↑ Nishiyama, H.; Aoki, K.; Itoh, H.; Iwamura, T.; Sakata, N.; Kurihara, O.; Motoyama, Y. Chem. Lett. 1996, 25, 1071. ↑ Nowlan, D. T.; Gregg, T. M.; Davies, H. M. L.; Singleton, D. A. J. Am. Chem. Soc. 2003, 125, 15902. ↑ Johnson, T.; Cheshire, D. R.; Stocks, M. J.; Thurston, V. T. Synlett 2001, 646. ↑ Hodgson, D. M.; Pierard, F. Y. T. M.; Stupple, P. A. Chem. Soc. Rev. 2001, 30, 50. ↑ Suga, H.; Inoue, K.; Inoue, S.; Kakehi, A.; Baba, T. J. Org. Chem. 2005, 70, 10782. ↑ Hodgson, D. M.; Labande, A. H.; Pierard, F. Y. T. M.; Castro, M. Á. E. J. Org. Chem. 2003, 68, 6153. ↑ a b Hodgson, D. M.; Le Strat, F.; Avery, T. D.; Donohue, A. C.; Brückl, T. J. Org. Chem. 2004, 69, 8796. ↑ Padwa, A.; Kassir, J. M.; Semones, M. A.; Weingarten, M. D. Tetrahedron Lett. 1993, 34, 7853. ↑ Oguri, H.; Schreiber, S. L. Org. Lett. 2005, 7, 47. ↑ Padwa, A.; Austin, D. J.; Hornbuckle, S. F. J. Org. Chem. 1996, 61, 63. ↑ Padwa, A. J. Organomet. Chem. 2005, 690, 5533. ↑ Hodgson, D. M.; Stupple, P. A.; Pierard, F. Y. T. M.; Labande, A. H.; Johnstone, C. Chem.−Eur. J. 2001, 7, 4465. ↑ Muthusamy, S.; Krishnamurthi, J.; Nethaji, M. Chem. Commun. 2005, 3862. ↑ a b Padwa, A.; Curtis, E. A.; Sandanayaka, V. P. J. Org. Chem. 1996, 61, 73. ↑ Baldwin, J. E.; Mayweg, A. V. W.; Neumann, K.; Pritchard, G. J. Org. Lett. 1999, 1, 1933. ↑ Padwa, A.; Austin, D. J.; Price, A. T.; Weingarten, M. D. Tetrahedron 1996, 52, 3247. ↑ Muthusamy, S.; Gunanathan, C.; Suresh, E. Tetrahedron 2004, 60, 7885. ↑ Hamaguchi, M.; Tomida, N.; Iyama, Y. J. Org. Chem. 2007, 72, 1326. ↑ Nair, V.; Mathai, S.; Nair, S. M.; Rath, N. P. Tetrahedron Lett. 2003, 44, 8407. ↑ Cox, G. G.; Moody, C. J.; Austin, D. J.; Padwa, A. Tetrahedron 1993, 49, 5109. ↑ Padwa, A.; Hornbuckle, S. F.; Fryxell, G. E.; Zhang, Z. J. J. Org. Chem. 1992, 57, 5747. ↑ Kim, C. H.; Jang, K. P.; Choi, S. Y.; Chung, Y. K.; Lee, E. Angew. Chem., Int. Ed. 2008, 47, 4009. ↑ Eberbach, W.; Brokatzky, J.; Fritz, H. Angew. Chem., Int. Ed. Engl. 1980, 19, 47. ↑ Ishikawa, H.; Elliott, G. I.; Velcicky, J.; Choi, Y.; Boger, D. L. J. Am. Chem. Soc. 2006, 128, 10596. ↑ Snider, B. B.; Wu, X.; Nakamura, S.; Hashimoto, S. Org. Lett. 2007, 9, 873. ↑ Muthusamy, S.; Gnanaprakasam, B. Tetrahedron 2005, 61, 1309. This page was last modified on 5 September 2013, at 03:22.